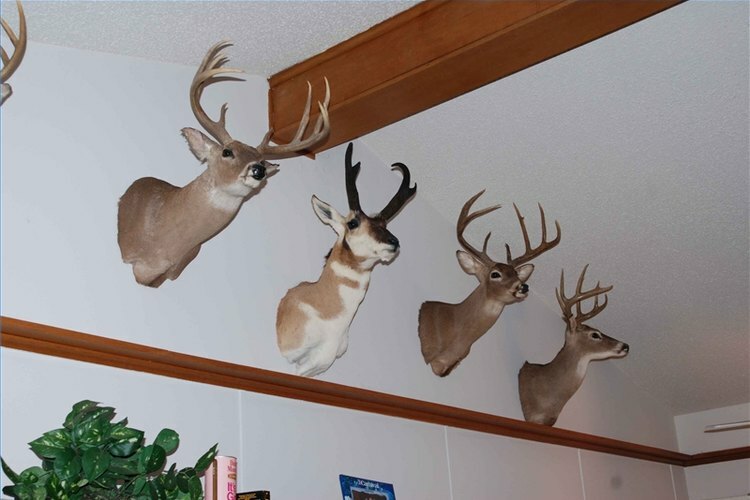 Your deer mount deserves pride of place. A deer mount hung on your wall is a way to honor that particular animal. Hung proudly on your wall, the deer and the memory of that hunt will live on in your mind. Sometimes the sheer size of the animal may make it tough to find the right spot to hang the mount. Take some time to find the best location for your trophy. Measure the mount from the top of the antlers to the base of the mounting plaque with your tape measure to get an idea of the total area required to hang the deer. Survey the room and determine the ideal location for the mount. Take note that even a small buck deer mount requires a lot of area above and below the screw mount area. Scan the wall where you want to hang the deer with the stud finder to locate a stud. Drill a hole with a small diameter drill bit through the drywall and into the stud. Use the screwdriver or the cordless drill to screw the mounting screw into the stud. Determine what type of mounting bracket is on the back of the mount. Different taxidermists use different brackets, but usually all will hang on a suitable screw. Hang the mount on the screw and make sure the screw fits firmly into the bracket. Adjust the screw out or in as necessary to get a good secure attachment. Make sure the mounting board hangs close to the wall and use the level, if needed, to get the deer hanging straight. Use caution when climbing ladders.